This job search site performs a real-time comparison of job openings and a job seeker's profile. 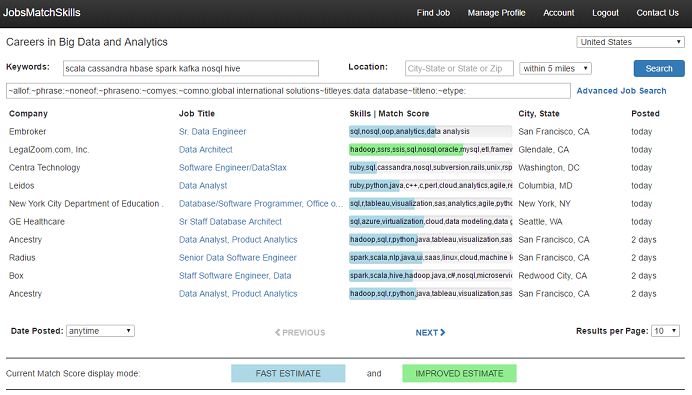 A registered job seeker can see his/her Match Score for multiple positions instantly, while browsing job listings. A registered employer can filter out job seekers' profiles based on mandatory characteristics and then browse through selected profiles for AI-powered evaluation which allows them to see immediately the relevance of each applicant's profile to job posting requirements based on education, skills, and work experience. The product uses Apache HBase on top of Hadoop cluster for data storage and is highly scalable, stable and secure. 100% uptime was maintained for several months in a row. Internal email and instant messaging is available to registered employers and job seekers. A registered user can create chat groups, invite other registered users,,send and receive messages.